Infected abalones are discoloured and weakened and can be detached easily from the substrate. They do not attempt to right themselves when turned upside down. Xenohaliotis californiensis is a proposed new genus and new species of intracellular prokaryote with morphological characteristics of the class Proteobacteria, order Rickettsiales and family Rickettsiaceae, occurring in the epithelium of the intestinal tract (Friedman et al. 2000). It causes the disease known as “withering syndrome” of abalones, responsible for mortality since the mid 1980s among natural and cultured populations of abalones from the West coast of the USA (California) and Mexico (Baja California). Up to 95-100% of natural populations of black abalone Haliotis cracherodii from California islands near San Francisco disappeared in the late 1980s. Xenohaliotis californiensis has recently been found in the European abalone Haliotis tuberculata (Balseiro et al. 2006). Picture 1 : Intracytoplasmic vacuole containing numerous Xenohaliotis californiensis bacteria inside the gut epithelium of the abalone Haliotis rubra (H&E staining). 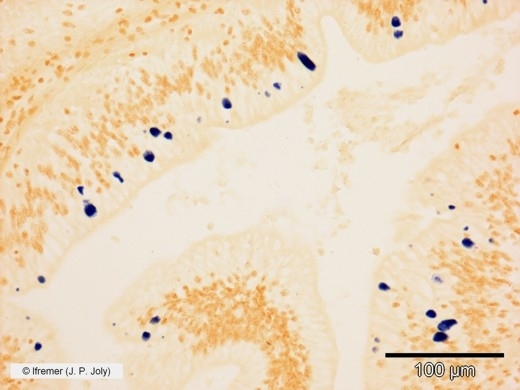 Squash preparation of gastrointestinal tract can be stained by Hoechst solution (10 µg.ml-1 of bisBenzimide in distilled water) and observed with epifluorescent ultraviolet light and filters (356 nm excitation and 465 nm emission). Large bacterial inclusions in gut epithelium appear bright blue (Moore et al., 2001). In histology, colonies of bacteria appear in large intracellular colonies in the epithelium of the digestive tract (see picture 1 above) and particularly in the enzymes secreting cells of the digestive diverticula. A PCR reaction using species specific primers (RA 5.1 and RA 3.6) has been developed (Andree, Friedman et al. 2000). This technique appears to be more sensitive than histology technique (Balseiro, Aranguren et al. 2006). An in situ hybridisation test (picture 2) using 4 probes designed from the small-subunit of ribosomal DNA has also been developed (Antonio, Andree et al. 2000). 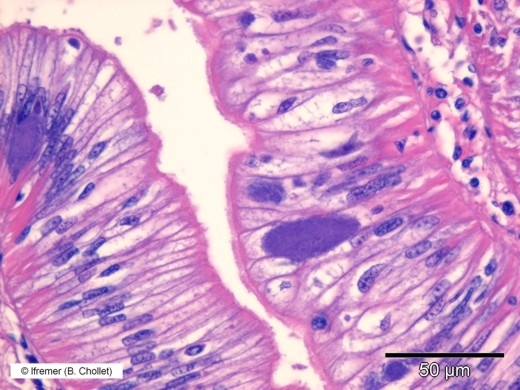 Picture 2 : in situ hybridisation showing intracellular colonies of bacteria (dark blue staining) inside epithelium cells of the intestine of Haliotis rufescens. Sensitivity and specificity of the PCR test are in the process of being assessed. Techniques to be used on all post-larval stages but preferably on oldest animals. Difficulties or impossibility to recover from an upside-down position, together with weakness, retraction of the mantle and the foot in severe cases, are symptomatic – though not specific - of withering syndrome of abalones. Usually necrotic parts of the foot tissue can also be visible. Tissue squash of the post-oesophagus part of digestive tract stained by a modified Giemsa stain (e.g. Hemacolor) or by a fluorescent stain for nucleic acid is an easy and quick technique that can be used for presumptive diagnosis. Other parts of the animal can be fixed 24h in Davidson’s fixative for further histology study and ISH technique to confirm the pathogen presence. Alternatively, small pieces of tissue (post-oesophagus, digestive gland and foot) can be sampled for the confirmatory PCR test. Xenohaliotis californiensis is not listed by the EU legislation. Xenohaliotis californiensis is listed by the OIE Manual of Diagnostic Tests for Aquatic Animals (2009 version) and Aquatic Animal Health Code (2009 version). Antonio, D. B., K. B. Andree, et al. (2000). "Detection of Rickettsiales-like Prokaryotes by in Situ Hybridization in Black Abalone, Haliotis cracherodii, with Withering Syndrome." J. Invert. Path. 75(2): 180. Balseiro, P., R. Aranguren, et al. (2006). " Candidatus Xenohaliotis californiensis and Haplosporidium montforti associated with mortalities of abalone Haliotis tuberculata cultured in Europe." Aquaculture 258 (1-4):63-72. Friedman C., Andree K.B., et al. (2000). " Candidatus Xenohaliotis californiensis", a newly described pathogen of abalone, Haliotis spp., along the west coast of North America. Int. J. Syst. Evol .Microb., 50: 847-855. Moore J.D., Cherr G.N. & Friedman C.S. (2001). Detection of " Candidatus Xenohaliotis californiensis" (Rickettsiales-like procaryote) inclusions in tissue squashes of abalone ( Haliotis spp.) gastrointestinal epithelium using a nucleic acid fluorochrome. Dis. Aquat. Org., 46: 147-152.